Get swept away with 10 little rubber ducks! goes the rubber duck machine. A brand-new batch of rubber ducks is loaded on to a ship and sent off to be delivered to children everywhere. 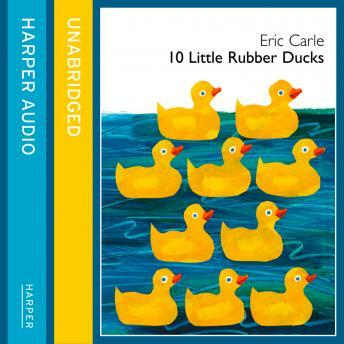 But when a storm strikes, 10 little ducks are tossed into the sea and swept away in 10 different directions - with some wonderfully unexpected adventures along the way. Come ride the waves as legendary children's book author and illustrator, Eric Carle, explores numbers, directions, opposites, geography, animals and more in an extraordinary book, beautifully performed by Sheila Hancock. SQUEAK!